Like any other kind of art, films can often evoke questions within the viewer, such as "what's in the box?!" However, with his latest effort, Hotel Artemis, writer-director Drew Pearce managed to answer one question I'd never even considered: "Who cares for the criminals that don't get caught?" Set in the near future, against a backdrop of Los Angeles caught in the midst of brutal rioting over privatized water, Hotel Artemis offers a look into the lives of those that operate in L.A.’s criminal underbelly. The titular building is a secret high tech, high security, low capacity hospital established for the sole purpose of creating a safe place for criminals to seek treatment for their injuries. One of the film’s biggest strengths is the cast, with Pearce calling in a surprisingly strong looking ensemble. Jodie Foster breaks a five year absence from the screen as The Nurse, the agoraphobic operator of the Artemis. Emmy Award winner Sterling K. Brown stars as Waikiki, a criminal injured in a bank robbery gone wrong. Guardians of the Galaxy star Dave Bautista upholds his tradition of playing the loveable tough guy as Everest, The Nurse’s right hand man at the Artemis. Sofia Boutella provides the movie’s femme fatale as Nice, an assassin on the job whose path has crossed with Waikiki’s before. Charlie Day offers a strong performance as Acapulco, the sleazy, misogynistic arms dealer with a short fuse. Rounding out the star studded cast is Jeff Goldblum, starring as The Wolf King of L.A., one of the strongest men in the city’s criminal underworld. The plot for Hotel Artemis is an absolute mess in some of the best ways. The Nurse, Waikiki, Nice, Acapulco, Everest, and The Wolf King all have their own story lines, playing out simultaneously as they try to survive L.A. tearing itself apart around them. Between The Nurse’s struggle to overcome her agoraphobia and come to terms with a traumatic loss in her past, Waikiki’s efforts to save his brother Honolulu, Acapulco’s temper tantrums and plots to escape to safety outside of L.A., The Wolf King and his men demanding he be treated, and Nice’s efforts to finish her contract, there is always something happening and rarely a dull moment at the Artemis. My chief and only real complaint against Hotel Artemis is that it feels too safe. “Secret hospital for the criminal elite” is an amazing premise for a film and when you add that to the strong cast that Pearce brought on board, it feels like the film could have been so much more than what it is. Its original and fun, but it isn’t ambitious. 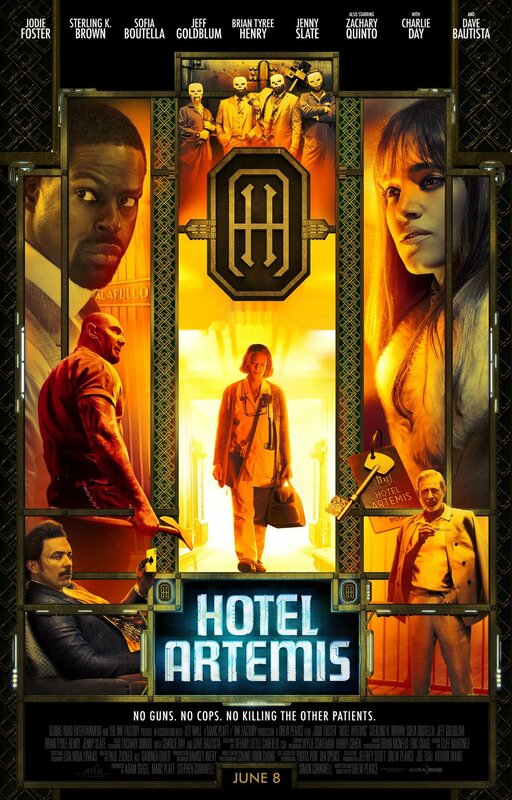 Despite that, I still recommend you check out the movie, If you are interested in watching Hotel Artemis you can find in theaters today.